Punjab's annual winter extravaganzas that were called NRI sammelans will no longer take place. When these were started 12 years ago, the events were expected to provide a platform to attract investments from non-resident Indians, and the government rolled out the red carpet for the diaspora. Pharmaceutical companies have renewed their strategies in favour of natural product drug development the world over. In this context, the resolve of the new government to take Ayurveda to a new level is positive. 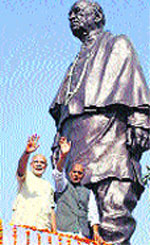 Pandit Jawaharlal Nehru and Sardar Vallabh Bhai Patel are two icons of the freedom movement. One was left of the centre and the other right of the centre but they sank their ideological differences to win freedom. THE diplomatic community in Beijing waited for July 1, 1997, with some degree of excitement. This was the day when Hong Kong was to officially revert to the mainland, marking an end of 156 years of British rule. Dr Syama Prasad Mookerjee, founder-President of the Jan Sangh (1951) was a forceful critic of Jawaharlal Nehru’s policy on Kashmir, particularly with regard to the State’s merger with the Union of India. Syama Prasad’s political feud with Nehru revolved around two basic issues : Nehru’s failure to contain, as he put it, the, communal elements among the minorities and Nehru’s misreading of the emerging crisis in Kashmir and as such his misplaced trust in Sheikh Abdullah. Punjab's annual winter extravaganzas that were called NRI sammelans will no longer take place. When these were started 12 years ago, the events were expected to provide a platform to attract investments from non-resident Indians, and the government rolled out the red carpet for the diaspora. Over the years, these ballooned into jamborees, each subsequent one outdoing what was done in the past. Real issues took a backseat and it became a great hail-fellow-well-met affair that cost the taxpayers a pretty penny. There were charges that only a certain part of the diaspora was represented, and delegates were cherry-picked from among the ruling dispensation's supporters. The Akali Dal government has come under much scrutiny since it failed to meet the expectations of the NRIs, who wanted its help in property disputes, among other things, for which fast-track courts were promised. Similarly, a centralised system to deal with the affairs of the NRIs has remained only a promise. The Punjab Government was thus unable to sort out the NRIs' problems. The government was also unable to convince the sons and daughters of Punjab to invest in the state. The administration is not perceived as business-friendly in spite of claims to the contrary, and thus it comes as no surprise that the government has not been able to attract any major investment for the state. Punjab NRI Affairs Minister Tota Singh has now announced that instead of hosting the NRI convention, Chief Minister Parkash Singh Badal will hold two Sangat Darshan meetings - one in Malwa and the other in Doaba - to sort out the NRIs' problems. This is a welcome move if it signals that the government is recognising the futility of its earlier attempts and attempting at course correction. The problems of NRIs need to be solved, and Punjab needs to show how it is responsive to the needs of not only its residents but also those who have left the land and are still tied to it emotionally. This should be the real focus of the government, not just holding extravaganzas. Pharmaceutical companies have renewed their strategies in favour of natural product drug development the world over. In this context, the resolve of the new government to take Ayurveda to a new level is positive. The announcement to create a separate regulatory board for herbal drugs will help in realising this goal. The need for herbal-based medicines can be gauged by the fact that in Europe, AnalytiCon Discovery has launched many a drug based on natural products in the Asia-Pacific region, MerLion Pharmaceuticals in Singapore has comprehensive structures and capabilities necessary for developing natural product-based drugs. China has successfully promoted its own therapies over the globe with a science-based approach. Even though India has woken up to the need rather late to exploit the $100 billion market, the National Ayush Mission, established by Prime Minister Modi, should bring hope to Ayurveda. There has been a steep rise in the demand for medicinal plants from India,in the quest for a holistic approach to health and wellness. The Pharmaceutical Research and Development Committee report of the Ministry of Chemicals had underscored the importance of traditional knowledge in medicine decades ago, but the moneyed pharmaceutical lobby and a lackadaisical approach of the government to regulate the herbal product industry made India miss the bus. According to the World Bank, trade in medicinal plants, botanical drug products and raw materials is growing at an annual growth rate between 5 and 15 per cent. India needs to make concerted efforts to modernise this sector, promote lab research and monitor the quality of products. This necessitates the availability of plants with standardised quality, free from toxic contaminant with the desired therapeutic activity. China has successfully overcome these challenges by implementing the government-sponsored good agricultural policies and good manufacturing practices. India is a repository of several living traditional knowledge systems with a proven track record which need to be pushed by scientific research to capture global markets. THE military correspondent of the Times (London) gently remonstrates against the stringency of the British Censorship. In the article which appears in the issue of the 16th October he says: "We are at length permitted to say that British troops are on the left of the Allied line." But other writers are much more bitter in their complaint. One of them is unhappy that he is not at liberty to disclose the locality where Indian troops are operating. Others feel miserable that their special war correspondents are not permitted to describe day by day actions in which the nation is interested. In the midst of all these complaints the Morning Post gravely assures the world that Mr. Churchill indulges himself in visits to the Continent. THE Madras High Court has just rejected an appeal petition in a suit in which a young Bairagi was alleged to have daringly personated the missing brother of a Brahman zamindar in the Kistna District and was denied a share in the ancestral property. The alleged personation happened so long ago as 1901 and there were two parties in the village, one believing the alleged imposter and the other not. There was a strong personal likeness between the alleged imposter and the missing young man, but the former was not so well acquainted with the family history, incidents in boyhood, identification of relatives and language. These defects were attributed to his habit of eating ganja and his subsequent forgetfulness. Strange to say he was readily admitted into the family of the young wife of the missing man, and there were issues of the marriage. The mother and brothers, however, refused to recognise him and a suit was filed for a share in the property. After Independence, the Nehruvian thoughts came to influence the country because he was the most popular leader and his thoughts fitted into the general sentiment of pluralism in the country. Naturally, the name of Sardar Patel receded. Prime Minister Narendra Modi has refurbished the past and brought Patel's name to the fore by celebrating his birthday as the "Rashtriya Ekta" day. It, however, goes to the credit of Modi that unlike his party, the Bharatiya Janata Party (BJP), he has not devalued the role which Nehru played in freeing and building the country. The BJP has not mentioned in its manifesto Nehru among the freedom fighters and builders of the nation. There are people who believe that India's interests would have been served better if Sardar Patel, in place of Jawaharlal Nehru, had been the country's Prime Minister. This hypothetical possibility had been voiced by Prime Minister Narendra Modi when he was the Gujarat Chief Minister. Of all the leaders, Maulana Abul Kalam Azad, Nehru's guide and philosopher, came to the same conclusion after watching Nehru as an administrator. Azad was in Nehru's Cabinet and saw him from close quarters. Azad told his secretary, Humayun Kabir, that they should have made Nehru the country's President and Patel its Prime Minister. By no stretch of imagination, Azad can be linked with Patel or his philosophy. During the national struggle, both ardent participants were poles apart and made no secret of their stance. Patel was a pro-Hindu but strictly adhered to pluralism. Azad was secular through and through and boldly faced the charge of "Hindu show boy" that the Muslim League made against him. He did not flinch even for a second to say publicly that the formation of Pakistan would be harmful to the interest of Muslims. He would say before Partition that the Muslims would walk proudly in the country with their heads held high, that they would be equal partners even though they were fewer in numbers. Once India was divided on the basis of religion, Hindus would tell Muslims that they had taken their share and should, therefore, go to Pakistan. Even after 67 years of division, this approach has not been disowned either in India or Pakistan. Pakistan has ousted practically all Hindus. However, Muslims in India continue to be a target of fanatics. When there is tension between the two countries, many Hindus refer to Muslims as Pakistanis. Little purpose will be served in pursuing this point because the wounds of Partition are far from healed and people in both communities continue to be exploited in the name of religion. Left to Patel, he would have had an exchange of population before accepting Partition. Nehru was different. He did not mix religion with politics or the state. The distance in separation in their approach made Mahatma Gandhi, who led the war of Independence, to nominate Nehru as his successor. Hindu-Muslim unity was a matter of faith with Gandhiji, not part of the policy. The typical example is that of Travancore. It announced its independence and initiated the process of seceding. VP Menon had a man in khaki when he went to the Travancore Maharaja. He signed the instrument of accession. He explained subsequently that he did not want his family to suffer and spend years in jail. Gandhiji was also confident that his secular ideals would be safer in the hands of Nehru. This was proved when Patel refused to release Rs. 64 crore to Pakistan. This sum was part of assets which India had agreed to transfer while agreeing to the Partition details. Patel argued that how could he release the money when India and Pakistan was engaged in a war over Kashmir. Gandhiji had to go on fast unto death to make Patel relent. The extremist Hindus had vitiated the atmosphere of amity over the sum of Rs. 64 crore. The society was sought to be polarised. They criticised Gandhiji again and again for being anti-national and anti-Hindu. The RSS, the fallout of the Hindu Mahasabha's philosophy of Hindutva, hatched a conspiracy and shot Gandhiji dead. Patel was quite right in banning the RSS and blaming it for disturbing the atmosphere of secularism. Once again the slant of Patel towards the RSS made him withdraw the ban once the organisation changed its character to become a cultural organisation. This was only a smokescreen behind which the RSS used the BJP for its political activities. Modi is its candidate. In fact, RSS chief Mohan Bhagwat has openly said that the outfit will be participating in politics. Nehru had exposed the duplicity of the RSS. When Azad thought Nehru's suitability for the office of President, he was confident that the communal forces had been crushed. He commended Patel's quality of being pragmatic and practical. Azad had come to have full faith in Patel's secular aptitude. That Modi is using Patel's image for polarising society is unfortunate. Practical as Patel was, he would have understood that India's destiny lay in a democratic, secular polity. He, as Prime Minister, would have deepened its foundation more firmly than Nehru. Hong Kong island had been acquired by Great Britain from China in 1842 as a sequel to the signing of the Treaty of Nanjing at the end of the First Opium War (1839-42). According to the 1898 convention, Hong Kong along with Kowloon Peninsula was leased to Britain for 99 years on July 1, 1898. As we were winding up from the office on June 30, 1997, news was making the rounds that a large public gathering was anticipated at the Tiananmen Square late in the evening. After dinner many of us headed for Tiananmen. The crowd gradually began to swell and there was jubilation in the air. At mid-night, as the countdown clock indicating time left for Hong Kong to join the motherland came to a standstill at zero, there were fireworks and loud cheers ; ‘Xianggang lai la’ (Hong Kong has joined). The next day, amidst pomp and pageantry, Prince Charles formally handed over Hong Kong to President Jiang Zemin. The former British colony became the Hong Kong Special Administrative Region with Tung Chee Hua, a 59-year-old shipping magnate, as the first Chief Executive. Under the agreement “One Country Two Systems” Hong Kong was to enjoy a high degree of autonomy, wherein its socio- economic system and lifestyle would remain unchanged for the coming 50 years. Many observers at that time were highly sceptical about China’s commitment to honour the agreement. They feared that over a period of time, authorities would go on to drastically curtail the rights and freedom of Hong Kong residents. Two years ago I was on AI flight 102 from New York to Delhi. My co-passenger happened to be a Chinese, who had graduated from one of the Ivy Leagues in the US and was working with an MNC in Hong Kong. Earlier, it was only the children of influential Communist Party office-bearers who were privileged to study abroad. Today, as Chinese students outnumber the rest, especially in the USA, a majority are from a non-elitist background. The young professional candidly admitted to be doubly lucky; most Chinese parents aspire to send their children abroad for higher education and a decent job in Hong Kong tops the wish list of an educated youth in the mainland. The individual was on a maiden visit to India and was headed for Bodh Gaya. Buddhism is fast becoming popular in China, as people are seeking greater choices in their personal lives. Hong Kong of late has been in the news due to the student protests, dubbed the ‘Umbrella Revolution’. The main reason for the student unrest is Beijing backtracking on electing the next Chief Executive through universal suffrage; instead it is allowing only candidates screened by the ‘Loyalist Committee’ to contest. President Xi has laid out a dream of a “prosperous and strong China”. With the 66th autumn of the Communist Party rule around, while the mainland Chinese seem to be content with the promise of prosperity, fellow countrymen in Xianggang are seeking prosperity along with democracy — a version of ‘Hong Kong Spring’. Going by the Chinese ancient history, a period of 'spring and autumn' between the 5th and 3rd centuries BCE was marked by internal state wars. Therefore, while PRC leadership seems to stand firm on the issue of ‘Hong Kong Spring’, it may relent, by offering — a different shade of autumn. Jawaharlal Nehru and Dr Mookerjee were both men of great intellect, well meaning, earnest and devoted to the cause of India. They had similar family backgrounds. The son of Sir Ashutosh Mookerjee, he was, like Nehru, born with a silver spoon and likewise took great pride in a public life of integrity and honesty. He once commented on how difficult it was to exist in public life with honest means: “I feel ever and ever more the need for a substantial regular income. I have no greed or love for wealth… suffer as I might, may God give me strength and wisdom to maintain my integrity and independence and not sacrifice them for money’s sake.” (Leaves From A Diary - Introduction, p. XVII). Mookerjee believed that Nehru failed to appreciate that if Hindu communalism was dangerous so was Muslim. He repeatedly warned Nehru that the longer the rope given to Abdullah the more he would complicate Kashmir’s political scene. Mookerjee proved dead right. Likewise, Mookerjee believed that for a Republic that would claim secularism to be at its core the State could not afford to take sides or appease a section the populace. In a historic intervention on the Uniform Civil Code in the Provisional Parliament, for example, Mookerjee questioned: “Why not have a separate bill prescribing monogamy for all citizens?”. He gave the answer himself: “…I know the weakness of the promoters of this Bill… they dare not touch the minority… but of course you can proceed with the Hindu community in any way you like…” The satire was there throughout. Mookerjee became the Vice-Chancellor of the country’s most prestigious, Calcutta University, at 33. A spell-binding orator, he fought his first election under the Provincial Autonomy Act as a Congress candidate in 1939. He won but resigned, to be re-elected soon as an Independent. Notwithstanding his Hindu Mahasabha background, he was chosen by Jawaharlal Nehru to join the Union interim Cabinet, from which he resigned after some time. Even as we await a definitive biography of Syama Prasad Mookerjee, studies suggest that he drifted into Right-wing Hindu political thought because he had observed the thoroughly communalised working of the Muslim League’s Coalition Ministry in Bengal (1937-41). The Praja Parishad (People’s Party) was founded by the 70-year-old Prem Nath Dogra (1949). It was a movement that represented the aspirations of the people of the Jammu region as against the National Conference, which was mainly a representative of the Valley. Mookerjee joined the Praja Parishad movement as a natural ally. While Sheikh Abdullah insisted, like Nehru, that the Parishad had communal agendas, Mookerjee insisted the movement was purely nationalist. For example, in one of his several important speeches in Parliament on the issue he said: “If the Constitution of India was good enough for 497 states why not for Kashmir…" (Monograph, Eminent Parliamentarians, Lok Sabha 1990). By the time the first General Election (1952) was held, the Jan Sangh which was not even four years old, managed to mark an all-India presence and even won three seats to the Lok Sabha. By now, Mookerjee was a nationally recognised opponent of the Nehruvian policy on Kashmir. Starting January, 1953, there took place an exchange of letters between Mookerjee and Nehru on the one hand and Mookerjee and Abdullah on the other. This exchange is engrossing and fascinating. The points are made with extreme clarity. Many of these letters were in excess of 3,000 words, some even 5,000 words and yet they were replied to within a day or two. Once, when Nehru was unable to respond the next day, he explained that he had been able to read Mookerjee’s letter only late at night. The first of this historic exchange of letters was initiated by Mookerjee in a long letter to Jawaharlal (January 9, 1953). (All the following excerpts are from the Nehru-Mookerjee correspondence Pt. I Allama Iqbal Library, Kashmir University, Srinagar): “… the state of Jammu & Kashmir is a part of the Indian Union it is perfectly open to the people of the rest of India to interest themselves in its affairs… the question of accession… should be finally and irrevocably settled… there should be no question of taking a general plebiscite for determining the will of the people (because)… the Assembly in the state is based on adult franchise… the greater the delay in having this moot question decided once and for all, the greater will be the possibilities of complication and unrest…". He also referred to the urgency of regaining the territories lost to Pakistan in the Pakistan-sponsored intrusion into Indian territory in the autumn of 1947. Coming to Article 370, Mookerjee said: “… you will remember this is a temporary provision and Shri Gopalaswamy Iyengar who had moved the adoption (in Parliament) had clearly indicated that this was so… you and Sheikh Abdullah could have done a lot… if you had proceeded on the right lines and not misunderstood everyone who might have differed with you…”. Two days later Syama Prasad answered: “… it will serve no useful purpose for us to discuss in this correspondence the justification of our both moving in different mental spheres or even to discuss the merits of such spheres…” Three more letters were exchanged — the last on February 17. The letters got more brief and more curt. Mookerjee had forwarded a copy of his Jan 9 letter of Nehru to Sheikh Abdullah, who replied a month later. Mookerjee was arrested on May 11, 1953 while on his way to Jammu as he defied the ban imposed on his entry into the state. He was imprisoned in Srinagar. It’s not commonly known that Mookerjee, as diary entries show, had a serious heart ailment. For example the entry of November 24, 1946: “… suddenly taken ill… taking complete rest… my heart trouble has worsened…” He was detained as just another prisoner. Jail authorities were casual and had overlooked his medical history. Not surprisingly, when he suffered his first cardiac arrest at 4 am on June 22, it took the authorities seven hours to shift him to a hospital and that too in a broken-down taxi. Notes in the private papers of Jayaprakash Naryan (NMML, New Delhi) show that in the hospital too there were lapses on the part of the doctors. His death occurred the same day. The body was flown to Calcutta on June 24, where huge crowds lined the streets to receive the mortal remains. A huge procession was organised on July 5, when a part of the ashes were brought to Delhi. “Kashmir Hamara Hai”, was the slogan of the day (Delhi Police Records NMML). His untimely death, at 53, was a setback for the Jan Sangh. In many ways, Mookerjee’s policy and approach to the Kashmir crisis was in tune with Sardar Patel. With the Sardar already gone, the death of Syama Prasad drew the curtain on perhaps the most influential critic of Sheikh Abdullah and, of course, on Nehru’s policy on Jammu and Kashmir. * Dr. Mookerjee believed that for a Republic that would claim secularism to be at its core, the state could not afford to take sides or appease a section the populace. * He became the Vice-Chancellor of the country’s then most prestigious, Calcutta University, at the young age of 33. * A spellbinding orator, Mookerjee fought his first election under the Provincial Autonomy Act as a Congress candidate in 1939. He won the election but resigned soon after to be re-elected as an Independent. * Notwithstanding his Hindu Mahasabha background, he was chosen by Jawaharlal Nehru to join the Union interim Cabinet, from which he resigned after some time.